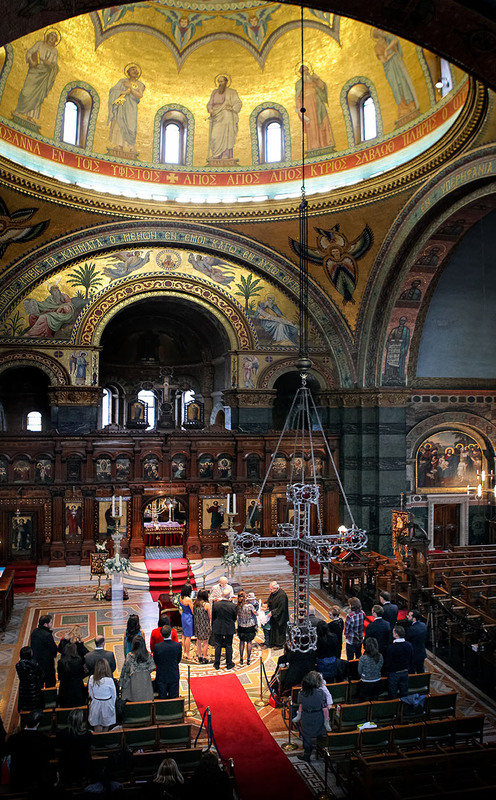 Since its consecration in 1882 St Sophia’s Cathedral has been the beating heart of the Greek Orthodox community in London. While the domed roof suggests something special from outside, nothing can really prepare the first time visitor for the splendour within. Instead of paintings, stunning intricate mosaics decorate the floor and provide the traditional iconostasis, while the rich colours and gilding make worshippers feel as if they are in an enormous jewellery box. It is absolutely breathtaking and lends itself perfectly to christening Photography London. Toddling around in jeans and a suit jacket before the start of the ceremony, little Alexandros charmed his parents and guests alike with his boundless energy. A cute and engaging by, he is his parent’s first child, and the apple of their eye. The mood was relaxed as I snapped photos of the guest of honour with his grandparents and godparents in the garden, and it was a happy group who made their way into the church for the service. 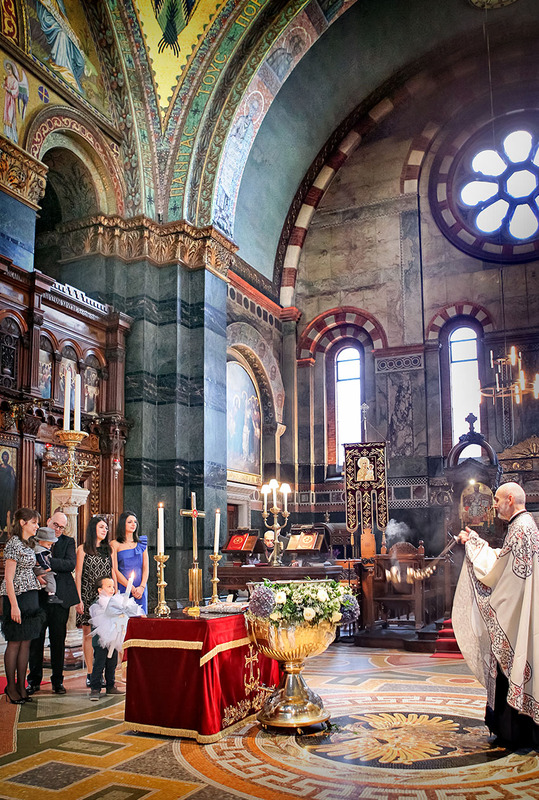 Father Theonas welcomed family and friends in front of the floral decorated baptismal font which was moved to centre stage beneath the dome, dramatically spot lit by the natural light flooding down. Alexandros wasn’t happy to be undressed and immersed in water to receive the sacrament of baptism, however he calmed down again when wrapped in the traditional white sheet and given a cuddle from his mum. Rather than a male and female, Alexandros had two godmothers, or “nones”. Their role is the same and it was clear they doted on the newest member of their family as they proudly stood and sponsored Alexandros as he was accepted into their church. Once the service had concluded it was time for the reception, which was held at MAZI in Notting Hill. The restaurant is popular for its modern Greek cuisine made from a combination of authentic Greek ingredients and local produce. It is certainly worth visiting if you’re feeling peckish! As well as great food MAZI has a fantastic, family-friendly atmosphere, making it the ideal place to finish taking photos for their christening Photography album. It was a relaxed ending to a very special day for both sides of Alexandros’ family. Alexandros’ parents took care with choosing the customary baptismal candle and witness pins, with a theme of baby-blue polka dots and elephants carrying through to the christening cake and favours at the reception. It was tastefully done to reflect the christening of a boy. Thank you to Alexandros’ family for allowing me to photograph his baptism. It was a wonderful occasion, full of love and grace. I wish him a lifetime of days as happy as this one. Congratulations.